Polk County, Wellmark, and the YMCA are inking a major land swap deal designed to return several vacant downtown buildings to use (reported in the Register). A letter of intent indicates that Wellmark under this deal, Wellmark would trade the former Penny's building at 222 Fifth for the Polk County Convention Complex and $500,000 cash - followed immediately by purchase of the Convention Complex by the YMCA. Seems to be a good deal for the former Penny's and Polk County Convention Center buildings... Not so sure about the Riverfront YMCA building that will likely be abandoned as part of the Y's relocation. In the Register article, Councilmember Christine Hensley was quoted as saying, "“I think that’s a great piece of land." Um... There is actually a building on that land. An architecturally significant building. Designed by William Wagner of the noted Des Moines architectural firm Wetherell & Harrison, the YMCA (1957-60) is one of the city’s largest and most important examples of International Style architecture. The building is composed of an eight-story residential tower facing the Des Moines River and a lower section containing community rooms, auditorium, natatorium and other public facilities. Not to mention the public art facade and iconic signage. It would be a shame to lose this substantial and unique building as part of whatever "development" is envisioned by the City. 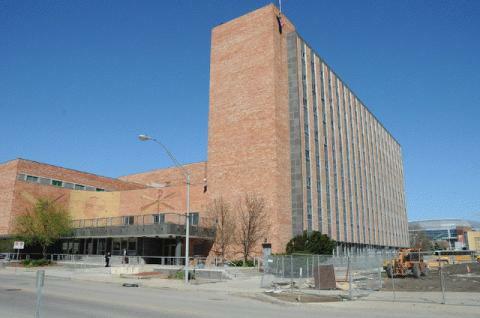 This building is officially considered endangered. During the uncomfortable winter months, the Downtown Farmers Market shifts to a more hospitable location in the Capital Square building. With one weekend down and one more scheduled for December 14/15, you can still seek out locally produced foods and crafts before the winter holiday season. Of course, the fresh fruits and veggies have largely disappeared... most winter vendors are selling things like locally produced honey, jams, salsa, wine, cheese, soy nuts, homemade noodles, baked breads, pies and cinnamon rolls. There will also still be locally produced eggs and meats as well as winter plants and crafts. 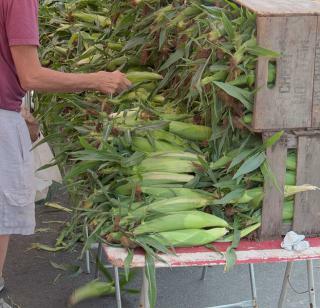 The Downtown Farmers Market is an important connection between the strong (and growing) Iowa small-farm culture and urban dwellers who want to be connected-but-not-too-connected with the people who produce the food they consume. It's also a pretty good time! ... and speaking of farmers markets, I continue to carry on my well-established tradition of NOTgoing shopping on "Black Friday". Or the day after. Or the day after. For many reasons, the buying frenzy surrounding this retail melee has never had an appeal to me. I do appreciate a good deal, but I'm not convinced that these major market retail sales are in fact a good deal given the externalities: masses of people crushing together grabbing at electronics and stuffed animals, overworked salespeople pulling all-nighters to handle the event, and of course, the time investment. Instead I shall endeavor to shop locally when I can in the days afterwards. Perhaps at Raygun, Gong-Fu Tea, Mars Cafe (of course), Kitchen Collage. Any other suggestions?